Seeing how I live near the Saco Lowell site and this is going to be a fairly large development, I have decided to make a construction thread for it. Here is a story from today's Greenville News about the project: http://greenvilleonline.com/apps/pbcs.dll/...EWS01/701130337 The only two retailers that have been announced so far are Wal-Mart Supercenter and Kohl's. Site plan package: http://www.cedarwooddevelopment.com/cde/la...e%20Package.pdf Leasing plan: http://www.cedarwooddevelopment.com/cde/la...sing%20Plan.pdf Parcel A/Retail A is going to be the Wal-Mart Supercenter, while Parcel D/Retail O is going to be the Kohl's. I have heard "rumors" around my church (which is Rock Springs) that an Olive Garden will be one of the restraunts and there will be an Old Navy and a Ross. I have also been told that a Target will be going directly beside Rock Springs (supposedley, Target is hammering out the contract on the land). These are all rumors though, so you never know. welcome to the forum, Goldenboyster. Sounds like some good stuff, if those rumors are true! Welcome to Urbanplanet, goldenboyster. What you said is the exact same thing I have heard too. I also heard that a Circuit City is going to be built next to or near the Target. Wow...Target, Circuit City, Old Navy, and Ross in Easley? 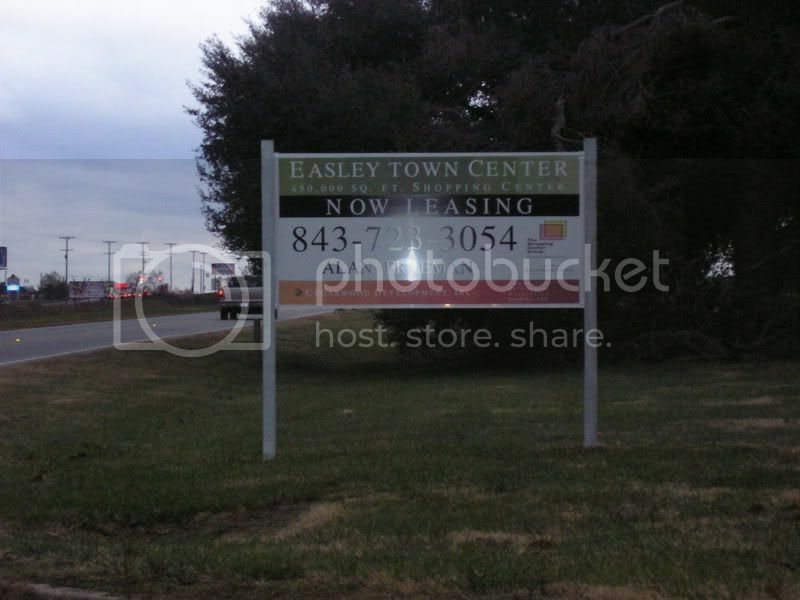 Although that is the "growing" side of Easley, do you guys think there is enough population there to support it? I guess they are also hoping to draw from Pickens, Liberty, Powdersville, and perhaps even parts of Greenville County. Yes. I live right down Highway 153 from this site and there are new neighborhoods going in left and right. Just drive down Highway 153 between Highway 123 and I-85 on any given Saturday and look at all the stake signs in the ground promoting new residential developments. At least 1/3 of the billboards on Highway 153 are for new residential developments too. This is interesting. I wonder how Anderson's big new shopping development and Greenville's growing retail scene will affect Easley's attempt to establish more of a shopping scene of its own. Easley has distinguished itself as the retail destination in Pickens County reaching out to Liberty, Pickens, and Powdersville. The exciting comings of known retailers and related businesses will only conintue to boost its appeal. The loser continues to be Anderson County, still trying to resolve its "blue laws" situation. If they wish to make the new center at Clemson Boulevard and I-85 successful, they must right the ship to attract retailers. Otherwise, Anderson County shoppers continue shop in Greenville, Oconee and Pickens counties. I was on 153 a couple of weeks back and couldn't believe the amount of new developments down all the side roads. New neighborhoods going up at the pace normally seen in the Golden Strip or Eastside. I'm curious if River Reserve and Acadia residents would frequent this center or simply head a few miles up 85 to Greenridge/Magnolia/The Point. Also remember that this will be closer to some Greenville Residents than Woodruff Rd. is. As a Downtown resident, I would likely head out here rather than woodruff, unless traffic is worse. I'd be more inclined to drive over to Easley than to Woodruff or Taylors to go to Target. Having Circuit City there would be a plus, too. I can live without Ross or Old Navy though, considering my proximity to Cherrydale. I assume the strip mall with the Wal-Mart, on the Clemson side of Easley, will be killed off by this? Just as that strip mall killed off that pitiful enclosed mall, Foothills Mall, which had a Wal-Mart? I have heard rumors that the Wal-Mart on the Clemson side of Easley will become a Sam's Club once the new Wal-Mart Supercenter at Easley Town Center opens. I live near Acadia and the River Reserve and would much rather drive to Highway 123 then deal with Woodruff Rd. So is the main store in this center Target or Wal-Mart? Or do we know for sure? Depending on which of these it is, could change the tenant mix greatly. I'm 100% sure it's a Wal-Mart Supercenter, because it says it will be on the lease/site plan. Same goes with Kohl's. Target would be across Highway 123 next to Rocky Springs Baptist Church. I hope they are preparing to widen US 123 to accommodate the huge traffic increase. It is already a busy road to begin with, especially at rush hour - and that's with vacant land/abandoned buildings where huge shopping centers will locate! So there are two developments....Easley Town Center and a yet to be named center with Target, both on opposite sides of 123 basically at 153? That's a good deal of development in this area. The side roads will be widened, but don't count on anything happening to that part of Highway 123 anytime soon seeing how they just repaved it. They are both on opposite sides of 123, but they are not at the junction of 123 and 153. They are more toward Easley than that by about a mile or two. Uh oh. We could be saying bye bye to 900 potential jobs: http://greenvilleonline.com/apps/pbcs.dll/...44/TRIBUNETIMES Thoughts and opinions? I guess nobody on this forum cares about Easley NOT getting 800-900 JOBS most likely: http://greenvilleonline.com/apps/pbcs.dll/...NEWS01/70223009 Thoughts and opinions? Interesting. I have lived just outside of Easley before, for many years. I do think Easley could use some more options, but I am not convinced Easley is ready for this type of a development anyway. 123 is not ready for such a development, and most Easley taxpayers probably do not want to pay for it. This would essentially be a Gville- Westside, Powdersville, Easley development; and I think it could easily be met by putting the project at 123/25 intersection, and keeping the Gville sprawl closer to the urban core. Many Easley residents commute anyway, so driving a few miles to another intersection would still meet their needs, without starting it's own sprawl. They may do better to make that site into a small planned residential area. I live just outside of Easley right now and I have to disagree with you. Almost everybody i've talked to that lives in this area wants this development to happen. This part of the Greenville MSA is growing at an amazing rate and it is time that they get a shopping center like Cherrydale. Yep i agree with G-man on this one. I grew up in the Wren area when i was young and would always go to Easley for things. This area is ready for it, and it is growing very fast.